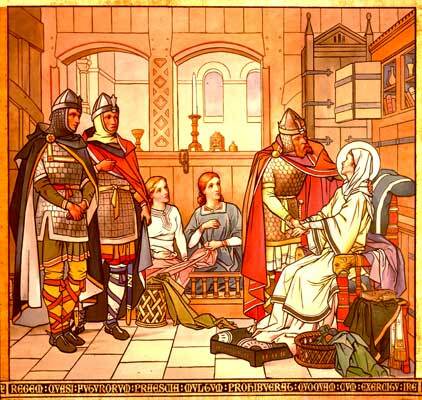 Margaret was born c. 1045 and was the niece of King Edward the Confessor of England. She was raised in Hungary and lived with her exiled father, Edward Atheling, her mother, Agatha, her brother, Edgar, and her sister, Christian. They returned to England in 1054. 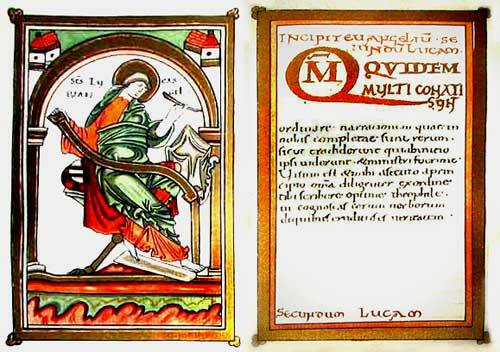 Early chronicles tell us that she read the scriptures in Latin, learned French and was trained in English needlework. Margaret married Malcolm III 'Canmore' of Scotland in c.1070. Margaret would have been about 24 years of age and Malcolm about 47. Ancient chronicles tell us that Margaret was more prepared for the cloister than the crown. However, Malcolm won her over and they were married in Dunfermline, then the seat of the Scottish kings. 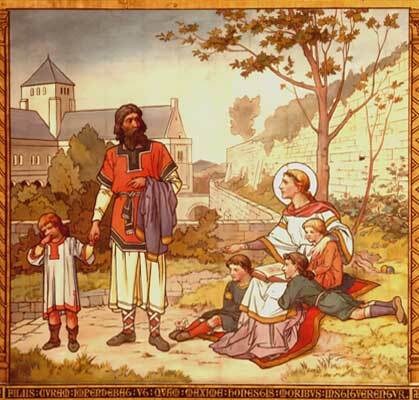 Tradition has it that after the Norman Conquest, Edgar and his sister Margaret decided to flee from William the Conqueror back to Hungary. Their ship was blown northwards in a fierce gale and they sheltered at Wearmouth. Later, they resumed their journey and landed at what is now called St Margaret's Hope in Fife. Other chroniclers report that Edgar had been defeated fighting the Conqueror's forces near York and then sailed to Wearmouth to meet Malcolm. 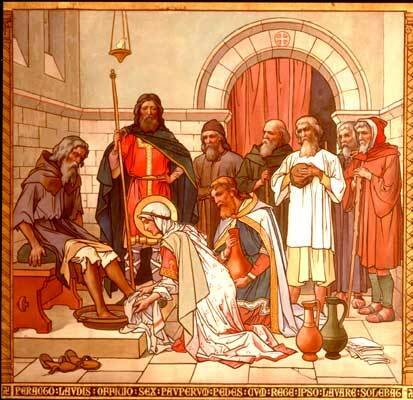 Malcolm was at that time campaigning in the north of England and he offered Edgar and his retinue refuge in Scotland. 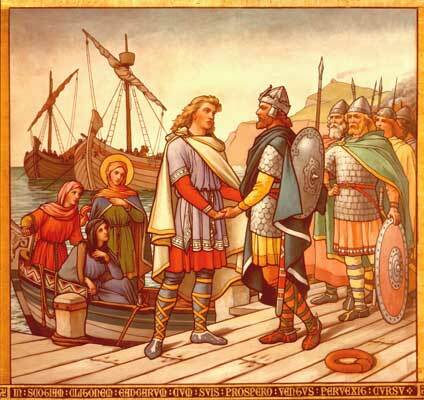 Edgar and Margaret accepted his offer and sailed north in October 1069. Margaret had a significant influence on early Scotland. Although she was a patron of the existing celtic church, she also introduced to Scotland the Benedictines from Canterbury and had the Priory Church built which would eventually become Dunfermline Abbey. 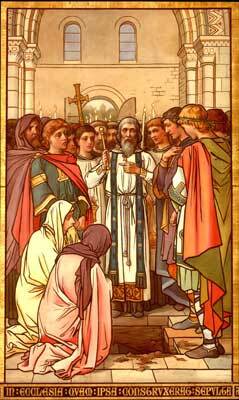 Margaret also had a chapel built at Edinburgh Castle and the church at Iona rebuilt after Viking attacks. Margaret was very pious and carried out many works of charity. She visited and cared for the sick and had hostels built for the poor. It was her custom that the poor should visit her every morning and be seated around her to receive alms. In secular matters, Margaret introduced many changes in fashion and manners which reflected her upbringing in a European court. 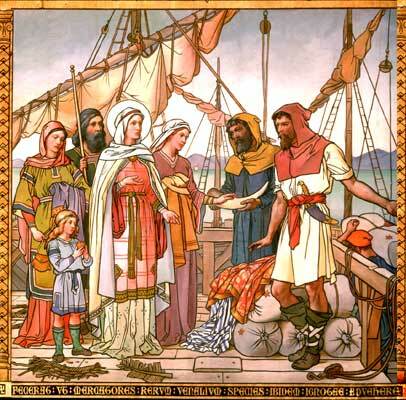 She was keen to develop economic links with Europe and introduced foreign merchants to Scotland. Margaret was a patron of the arts and education. Margaret's influence extended into politics. She provided council to Malcolm based on, it was said, a deep sense of religion, great personal piety and a concern for the ordinary people. 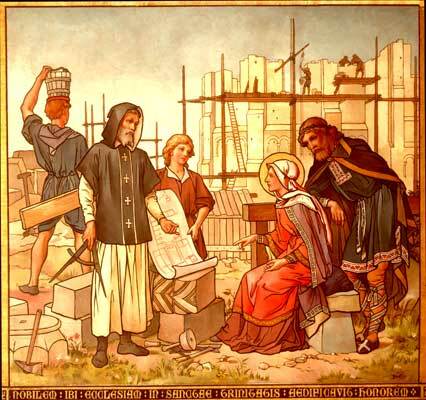 Margaret is said to have encouraged Malcolm to introduce English styled feudalism and parliament. Margaret and Malcolm had eight children, six sons and two daughters. Three of their sons Edgar, Alexander I, and David I, became Kings of Scotland. Her daughter Matilda married Henry I becoming Queen of England. 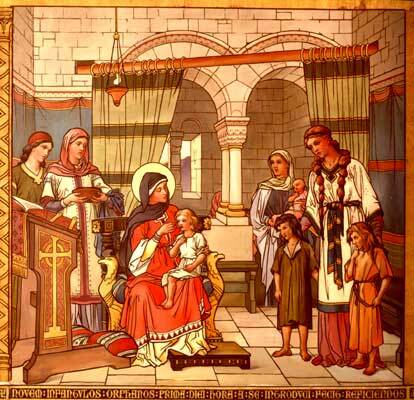 Unlike most saints canonised by Rome, St Margaret stands out as the happy mother of a large family. The ancient chronicles report that each morning Margaret had nine orphans brought to her "at the first hour of the day". She was then said to sit them upon her knee and feed them. Hostilities between Scotland and England in this period were common. In 1093 Malcolm, accompanied by his son Edward, left Margaret to fight the army of William Rufus, son of William the Conqueror. This was a sad parting. Margaret had developed an illness and Malcolm would not return. Malcolm engaged the English near Alnwick. He was killed in battle along with Edward, his son and heir. Margaret, already weakened due to illness, was not told of her husband's and her son's death for fear of worsening her condition. On her death bed, Margaret clasped in her hands a black cross which she held in deep veneration. This was thought to be part of the True Cross. Eventually Margaret learned of the death of her husband and son. Whether due to illness or the news of her loss, she died four days after Malcolm. 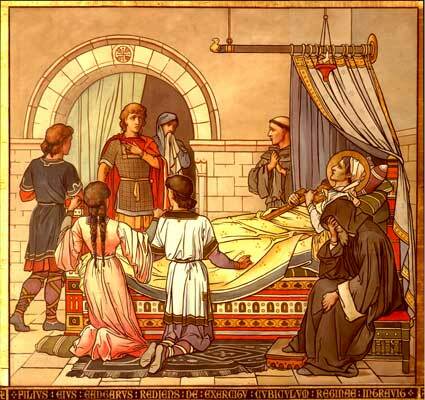 Margaret had lived an austere life spending many hours in prayer and frequently fasting. She was not yet 50 when she died. Margaret died in Edinburgh Castle and may have lain in state in the little chapel on the castle hill which still bears her name. 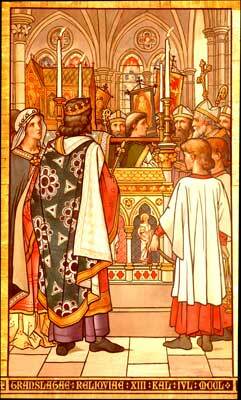 Queen Margaret's body was buried before the high altar at Dunfermline. In 1250 Margaret was canonized by Pope Innocent IV, and in 1259 her relics were translated to a new shrine, the base of which is still visible beyond the modern east wall of Dunfermline Abbey. During the Reformation her head passed into the possession of Mary Queen of Scots. It was later secured by the Jesuits at Douai, where it is believed to have perished during the French Revolution. The rest of the relics, together with those of Malcolm, were acquired by Philip II of Spain, and placed in two urns in the Escorial near Madrid. When Bishop Gillies of Edinburgh applied through Pius IX for their restoration to Scotland in the 19th century, they could not be found. According to legend, St Margaret's Gospel Book, richly adorned with jewels, was one day dropped into a river. The book was recoverd later and miraculously without any stain or damage. It is now held in the Bodleian library at Oxford. There is a copy of this book in St Margaret's Chapel, Edinburgh Castle.